Life is often forgotten beyond the headlines. A nation recoiled in horror with the murder of journalist James Foley on August 19, 2014 and introduced a new word into our collective vocabulary — ISIS. James' friends in the Pilsen neighborhood of Chicago sought to remind us and console each other that James was more than a statistic. More than a journalist. James Foley was a poet, a drummer, a hip-hop performer, an educator and ironically enough an anti-war activist. He may have been born in Evanston and raised in New Hampshire but James Foley had called Pilsen home. Not only does he live in the hearts and memories of his family and friends, James Foley is now remembered on a wall in Pilsen as a mural across the street from his favorite hangout — the Café Jumping Bean. The wall was donated by his landlord Paul Guizar. 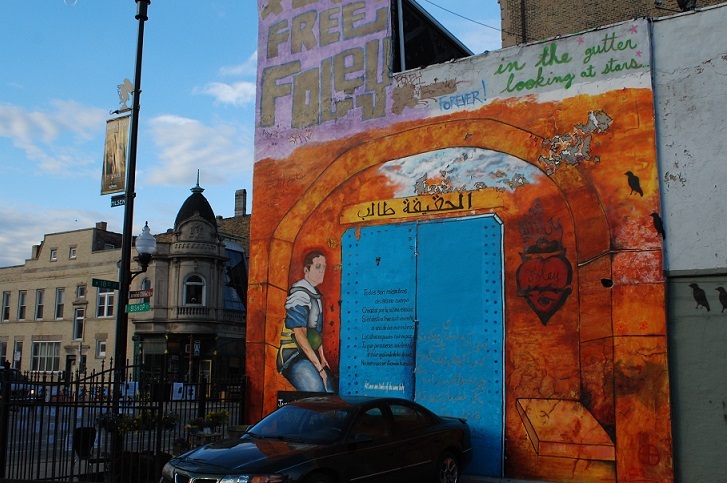 Painted by a group of ten of James' friends who worked in shifts around the clock, the two-story mural is entitled, in Arabic, Seeker of Truth. 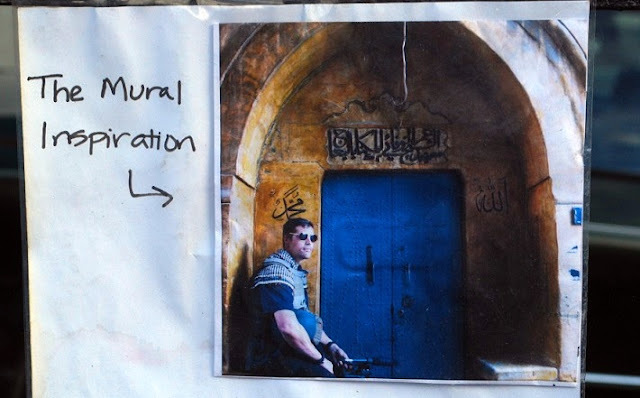 It is based on one of the last known photographs of Foley in Aleppo, Syria taken two weeks before his capture and captivity on November 5, 2012 by Nicole Tung. Inscribed on the mural is the poem Bani Adam by Persian poet Saadi Shirazi (1210-1292). The poem is featured in Arabic, English and Spanish. The three languages of the three cultures that helped to inform and shape the life and times of James Wright Foley. The mural was completed by October 18, 2014 the date that would have been James' 41st birthday. His friends will gather again at the corner of W. 18th Street and S. Bishop Street in the spring of 2015 and put the finishing touches to the mural. To them, his friends and family, James Foley will always be more than a fading headline. This is a beautiful commemoration. As I continue with school, I hope to one day be half the passionate, hardworking journalist he was.